(Photo: Showtime) By Michael Montero: The crowd at Staples Center was pumped for the main event, cheering local favorite Abner Mares as he faced off against Anselmo Moreno, the crafty veteran from Panama. Mares, originally of Mexico but now living in Hawaiian Gardens, California, was making the first defense of his WBC 122 pound title. Moreno, the former longtime bantamweight titlist, had moved up in weight for a crack at a title in a second division. The match started with a lot of mauling, as both fighters tackled their opponent to the canvas at one point in the opening round. Some rough stuff was inevitable due to styles. Moreno, a southpaw, tried to use movement and stay on the outside, but Mares would charge forward and bull his opponent into the ropes, where he’d tee off. This was the pattern during the early rounds, as Mares appeared to land the harder punches. In the fourth round, Mares landed a hard shot below the belt, prompting Moreno to hunch over and take a knee. The partisan Mexican-American crowd at the Staples Center didn’t like it, but it was a clear low blow. Undeterred, Mares continued to grind to the body, but Moreno would occasionally stand his ground and land his own thudding head shots. 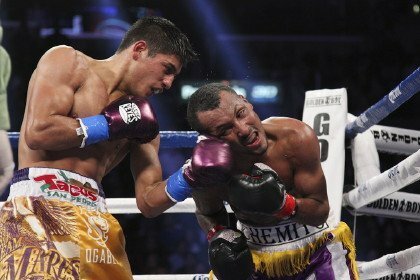 At the end of the fifth, Mares hurt and dropped the Panamanian with a vicious combination. He made it to his feet at the count of nine, but was in big trouble and appeared to be saved by the bell. The sixth round started with Mares charging forward and gunning for a knockout, but Moreno weathered the storm and connected with some big counters. Toward the end of the round, Mares caught Moreno on the ropes and landed several big, flush shots. But the veteran showed tremendous grit and handled the punches well. The next two rounds were a display of bravado and will, as both fighters took turns inviting their opponent to land punches. At one point in the eighth, Moreno had landed several punches on the American and appeared to have him hurt, only for Mares to motion to him for more. Then suddenly he exploded with a straight right that buckled and nearly dropped Moreno. The crowd was eating it up and began to chant “Mares, Mares”. It was tremendous two way action. The championship rounds were more of the same as both men – who appeared exhausted at times – took turns landing and eating bombs. Everything was shaping up for a close, competitive, dramatic conclusion. Yet in the eleventh round, the referee deducted a point from Moreno for pulling his opponent’s head down. Seeming as Mares had gone below the belt a couple times earlier in the bout; the sudden point deduction seemed like an overreaction. You just hate to see something like that during a good fight where both guys are pushing hard and giving it their all. None the less, Moreno steamed forward and had Mares hurt toward the end of the round, so it’d be easy to score it even. Both boxers made their case in the final round, but with the two points lost for Moreno it was hard to imagine he could pull out a decision in his opponent’s hometown. The scores came back for Mares: 116-110 twice and a third score of 120-106. The 120-106 (twelve rounds to none) tally was absolutely disgusting; Moreno deserved better after showing so much heart and toughness. But this was a clear win for Mares, whose stock continues to rise with each win. Tonight he managed to drop a durable veteran fighter who had not previously been down in his career. During the post fight interview in the ring, Mares called out Nonito Donaire. Who wouldn’t LOVE to see that one?! Besides one ludicrous score, this was a great main event, culminating an outstanding card at the Staples Center in Los Angeles. And you have to love Showtime for showing the undercard bouts on their “Showtime Extreme” network before switching over the main network for the headliners.